One game that I've been really excited to try out (and finally received a copy of!) is Revolver. (Sorry, no Amazon link yet - I may go back and add it later.) I love Bang!, and so the theme of Revolver really appealed to me. 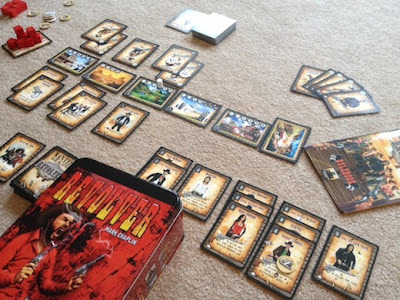 In Revolver, one player takes on the role of the Colty gang - who, led by Jack "The Crow" Colty, has just robbed a bank. Along with his 15 other gang members, Jack is now trying to catch the 3:15 train to escape. 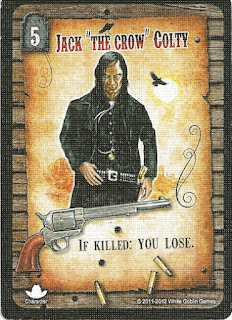 The other player takes on the role of Colonel McReady, who is trying to help bring the gang to justice - Wild West Justice (so, you're trying to kill them all). The game progresses through a series of battlefields, and to start each turn, the Colty player will advance the turn marker to indicate how close he is to escaping to the next battlefield (and ultimately to escape on the train). Next, on either player's turn, the active player draws two cards and then plays as many cards as they want from their hand. 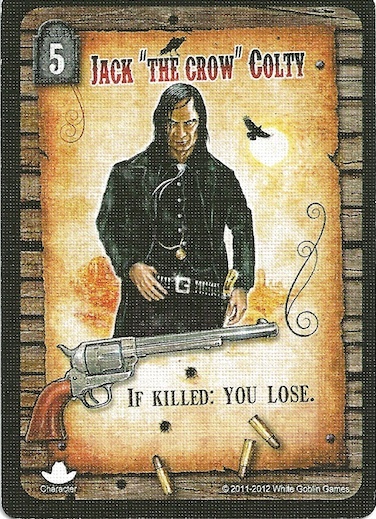 Some of these cards will go to a battlefield, where the McReady player is trying to shoot the members of the gang, and the Colty player is trying to shoot back and take cover in order to stay alive. At the end of the McReady player's turn, the Colonel will attack the Colty gang. Players will compare their fighting total, and if the Colonel wins, he kills one of the gang members. And, if the Colonel does not successfully kill any gang members on his turn, then they get a bit closer to escaping to Mexico (you remove a token from the "Mexico Border") card. Play continues like this until either Jack "The Crow" Colty has been killed, he has escaped on the 3:15 train (he survives until the end of the train battlefield), or his gang has escaped to Mexico (all of the tokens were removed from the Mexico Border card). So, the first pro for Revolver has to be the theme. The Wild West theme is incredibly fun, and is integrated well into every part of the game. 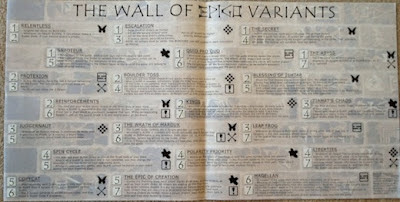 Between having all of your gang members out, fighting through different battlefields, and occasionally having a Buffalo Stampede charge at you, I think that anybody looking for a Wild West game will really enjoy the lore that this game creates - the back two pages of the rulebook even go into details about all of the members of the gang, and give you a back story about them all. A nice little touch that I really enjoyed (because I've done a minor amount of coin collecting) is that the Colty player's cards show a pile of Morgan Dollars on the back of them (silver dollars that were in use at the end of the 1800's). 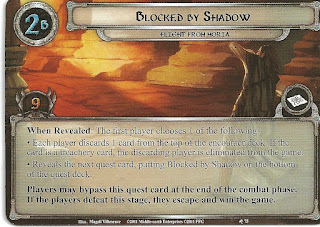 The next pro, and truly the main strategic choice in the game, lies in balancing when to play various cards. Because the pursuit changes locations, setting up an ambush for the Colty gang cannot happen all at once. If you put all of your deputies in a single location, then you'll definitely kill some Colty gang members there - but once they escape that location, you won't be able to continue your pursuit! Essentially, each battleground has a certain number of turns that you will be there (which can go up or down based on cards). Especially around the last turn of each battleground, both players have to weigh the value of playing a lot of extra cards at a location - it will help them win the next fight, but then those cards will be stranded at that location and unable to move! With those pros listed, there were also a few cons with Revolver. The first one is simply that certain things aren't especially clear. For example, the cards have small icons in the bottom left corner that say things like "Action," "Character," and "Firepower". 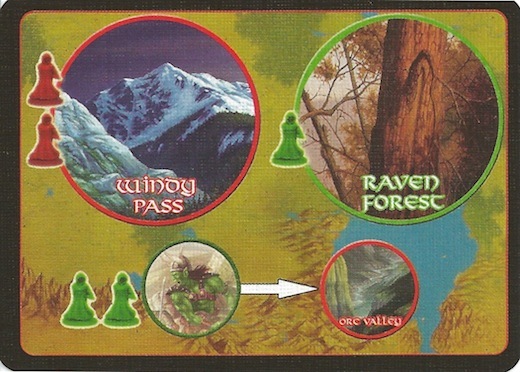 Yet, some Action cards appear to work the same as the Character and Firepower cards - by being played and staying at the location. Yet, one of the rules is that "The Colty Gang has a three card limit. This means he can only play a maximum of three firepower cards at each battlefield. Once three cards have been placed by the Colty Gang player, he may not place any more cards at that battlefield..." (I added the italics.) So, how do Action cards fit into this? 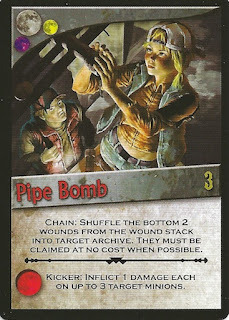 One specific action card is the "Gatling Gun." This Action is very powerful. Does it being an Action imply that it goes away after a time? This doesn't fit well with the rest of the rules, however. I have looked through the rules repeatedly and also looked through the official FAQ, and I haven't found the answer to what these symbols mean. If he's good, why's he killing 16 people? The next con to Revolver is that the winner truly seems to be determined by the luck of the draw. Both players have some pretty useful cards, and whoever draws more of these powerful cards will probably win. 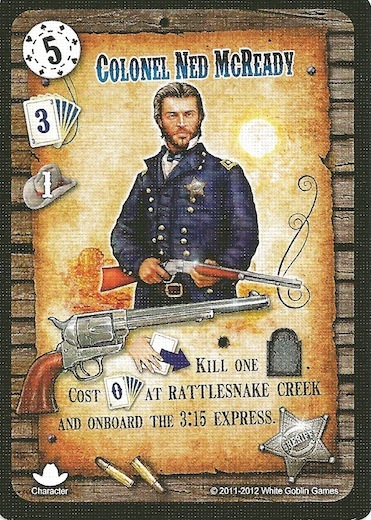 The McReady player has several cards that let him instantly kill bandits - if he draws several of these early in the game, then there is very little that the Colty player can do. 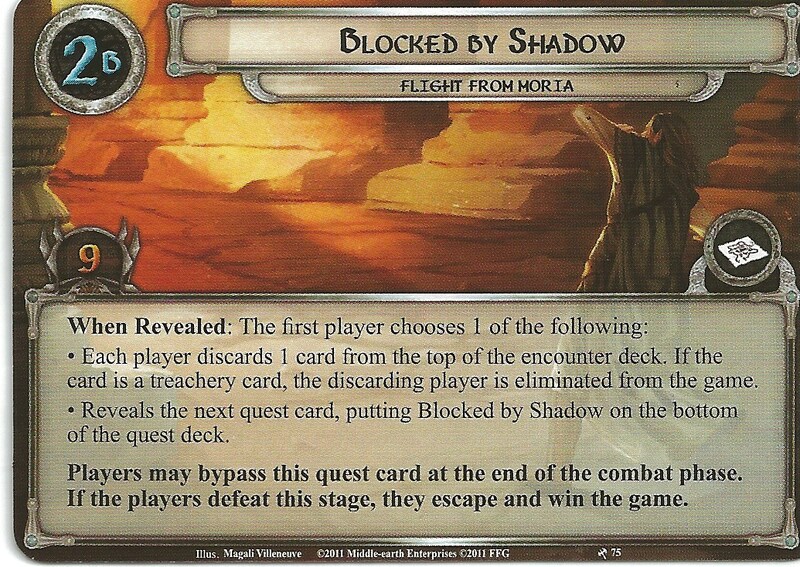 Yet, the Colty player has three cards that let him move through a battlefield more quickly. If he is able to get all of these (along with some of his other more valuable cards), he might be able to rush through the game and get the victory. But, though there is some strategy in determining what to play, and where to play it, there is a lot of luck involved in who can draw better cards. The next couple of things I will mention aren't pros or cons, but are things to be aware of. First, I am not sure if the game is balanced. Now, I have played it a few times, but not nearly enough to say with any certainty whether it is balanced or not. In addition, I have seen both sides win, so I know that it is possible. Yet, it still seems like the game is skewed in favor of the Colonel McReady player. He has so many cards that let him instantly kill bandits, that it is very hard to stop him from killing the gang. In addition, he also has significantly more cards that let him draw an extra card (which is really a bonus in itself), and also has a couple that let him keep the Colty player at a battlefield longer. Again, I don't know this for certain, but it at least gives me the feel that the McReady player has an advantage - if you've played the game a few times, I'd love to hear in the comments whether you have the same thoughts on the balance of the game. Finally, the cards have black borders, and they show wear incredibly quickly. I actually noticed that my copy was showing wear during the first game. 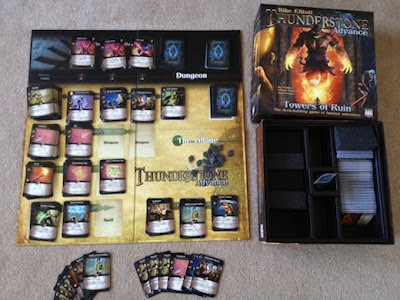 If you are a person that likes to put sleeves on your games in order to keep them pristine, you will want to have your sleeves ready before you start playing. I don't think that any of the cards are showing wear to the point that either of my decks is marked, but I was still a bit disappointed that before I finished my first game, it looked like I had played the game dozens of times. Overall, I give Revolver a 7.5/10. I enjoyed the theme, and I think that the game is fun to play, yet I think that the game is luck driven enough that I probably will not play it too often - just occasionally as a nice, light, change of pace. If you like Revolver, you might also check out my reviews of Bang! (of course), Wyatt Earp, and Gubs (if you have kids). I would like to thank Stronghold Games for providing me with a review copy of Revolver. Since I love Nightfall, I am glad that I was able to try out Nightfall: Blood Country. In this review, I will assume that you are familiar with Nightfall - if not, I recommend checking out my review of it. Here is the extent of the changes in Blood Country - when drafting, all of the extra cards that will be shared by the players are revealed before players select the cards for their private archives. That's it. This is a nice change, as you can actually draft knowing whether or not your cards will work with some of the center cards. However, it's obviously not a huge change. The first thing that I will talk about with Blood Country is that the packaging is very small. Because of this, some people might balk at the MSRP being $35. However, the box comes with 24 new archive cards. Considering that the "promo" archives that they offer wind up being $5 per archive, $35 for 24 archives really isn't very expensive. Secondly, if you decide to combine all of your cards into a single box (for ease of carrying), then why would you want a large empty box? All of the cards from Nightfall, Martial Law, and Blood Country easily fit into the original or Martial Law box. Plus, if you want to carry around just Blood Country (or a different subset of cards), the box is large enough to hold all of the new cards as well as the starter decks and wounds from the other sets (as well as a few favorite archives), and takes up much less space. So, overall, I think that the packaging (though initially causing the expansion to look way overpriced) is ideal for what you receive, and the product itself seems priced appropriately. Those are really the only additions and controversial issues with Blood Country. So, now I'll just mention a few of my favorite cards. The first one is called "Pipe Bomb." Pipe Bomb lets you shuffle the bottom two wounds from the wound stack (the extra wounds), and shuffles them into one of the archive piles. This card really seems very unique, and can also be very powerful at slowing down (or at least punishing) a player that is buying lots of cards from single archives - especially if they are coming from his private archive. Another one of my favorite cards is "Harley Doberman." Harley forces all players to discard a card from their hand each time they put a minion in play - and if they can't discard a card (or choose not to), then they receive a wound. I love playing a couple copies of this card at the end of a really long chain. 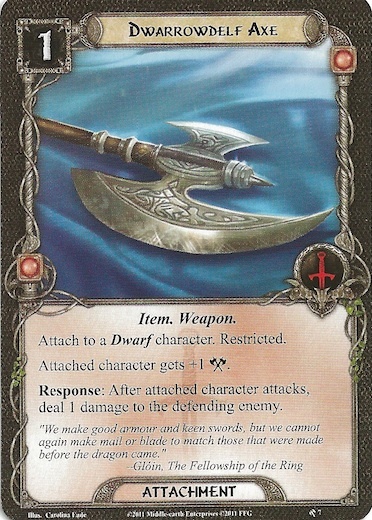 Because of how the chain resolves, Harley will be in play before the other minions, and so your opponents will either have to discard all of their cards, or (more likely) will wind up receiving a lot of wounds for the minions that they have in the chain. Overall, I give Nightfall: Blood Country an 8.0/10. If you are a Nightfall fan, I think that this is a great option for adding a lot of extra minions in a fairly inexpensive way. 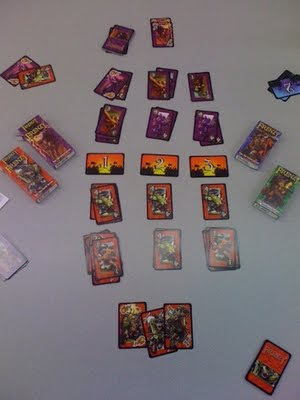 Plus, several of the minions add new strategies to the game aside from just gaining minions and dealing direct damage. If you like the darker theme of the Nightfall games, you might also check out Mob Ties, Gloom, and Betrayal at House on the Hill. 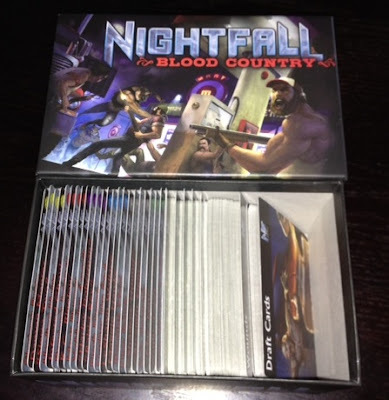 I would like to thank AEG for providing me with a review copy of Nightfall: Blood Country. 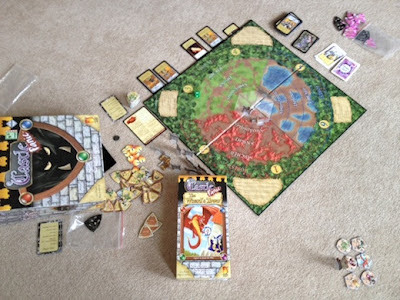 A game that I traded for a while back on BoardGameGeek since it looked quirky (and I didn't want the other game) was Dungeon Lords. In Dungeon Lords, you, evil genius ("evil"? slanderers!) are trying to protect your home, which some stupid townspeople are calling a "dungeon." In fact, those townspeople are really annoying and you'd like to eat them, but for the most part, you're leaving them alone. Though you're hungry. Anyway... you are simply focusing on building your glorious underground mansion - and then you hear that the obnoxious townspeople have hired people to come attack you! So, as any good home protector would do, you also hire monsters and set traps to keep people from breaking in. After all, you would protect your home if people tried to break in, right? How this plays out is that the game is played in 2 "years" each consisting of 4 rounds. In each round, you get to send your minions out to do tasks for you. These tasks include collecting food, convincing the townspeople that you're nice (which I find highly amusing), mining gold, digging tunnels, recruiting imps, building traps, hiring monsters, and building rooms. After the 2nd, 3rd, and 4th rounds, adventurers will come towards your dungeon, and at the end of the 4th round they will attack it (how rude!). Hopefully you have collected traps and monsters! 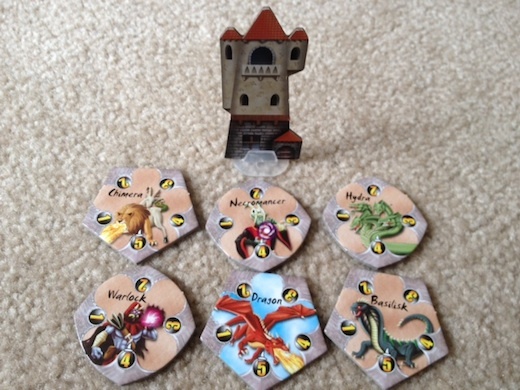 When they attack, you are able to use your traps and monsters to defend against them, and fighting is fought over a series of up to four rounds. Each round, if there are surviving adventurers, they will conquer one part of your dungeon (fortunately they will suffer fatigue first, which will injure and possibly even kill them). At the end of the four rounds, if there are any adventurers left, they give up and go home (claiming total victory over the "Wimpy Overlord" - I told you that they are slanderers!). After two years, you count up your victory points based on things like "Most Evil" and "Most Unconquered Rooms" along with negatives for having had tiles conquered and other bonuses for things like number of adventurers captured. Second, I really like how the minion placement works. This is really the crux of the game, as it is how you build your dungeon (thus this is a "worker placement game" or, more specifically, a "minion placement game"). Any given round you have two actions which you cannot perform (based on what you performed in the previous round). From the remaining actions, you select three and place them in order on your board. All players reveal, and then in turn order all players place a minion on their first choice, then all place on their second, and finally on your third choice. After this, all of the actions are performed in order, and normally the last person to place a minion on that action has the biggest benefit. However, there are only three slots on each action - so in a four player game it is possible to not get to place your minion if you wait too long. So, you need to balance waiting with making sure that you will get to perform an action. You also have to balance when you want to place various actions - after all, you can't have the best position on all of the different actions. And while you're trying to position yourself to be able to buy the best monster, your opponents are probably doing the same thing! 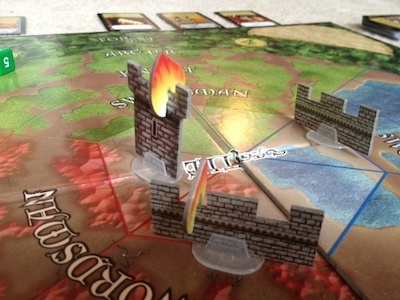 This flows very well but adds a lot of depth to the strategy of the game. 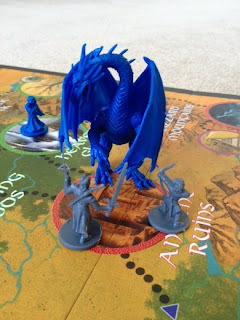 The third pro that I will mention about Dungeon Lords is that fighting the adventurers (once you understand the rules) is straightforward yet engaging. Essentially, every round they attempt to take over one section of your dungeon. You can place a trap and a monster to try to kill them. After your trap and monster damage them, they might heal or cast magic (if they have a priest or wizard) and then they experience fatigue. If they're still alive, they conquer a room. 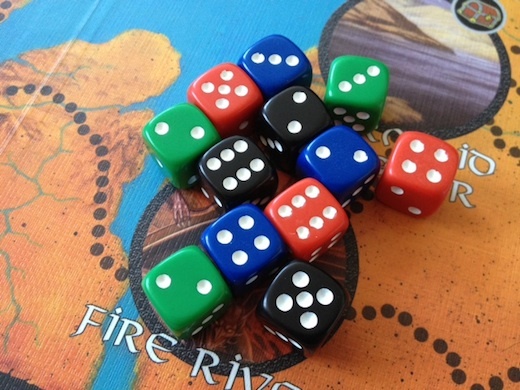 There's no dice rolling or complicated comparisons. Each monster does a certain amount of damage; each trap does a certain amount of damage (though this can be reduced by an adventuring Rogue). 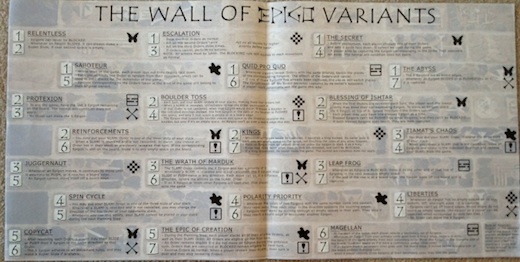 Yet, with the system put in place, there are still different types of adventurers, each adding an important and different element to the game. 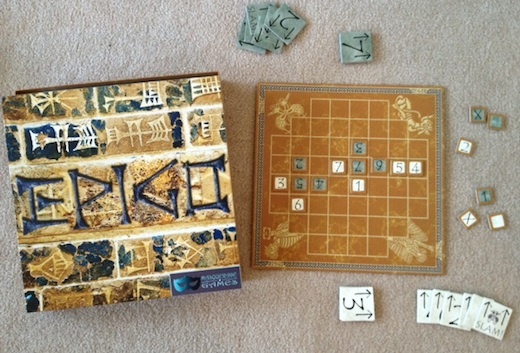 The final pro that I will mention is that the design of the gameboards is amazing. Having not played Dungeon Lords in a few months, I was able to pull out the game and remember 97% of the rules from the boards themselves - it's all there! 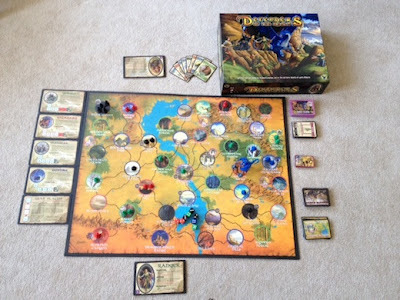 I think many other games would benefit from looking at how Dungeon Lords laid out it's components in a compact yet helpful way. With all that said, my biggest con for Dungeon Lords is that there are a lot of rules that you can easily forget. If you're like me, then you will often have a few months between two plays of any given game (because I have "a few" others to choose from). Whereas the gameboards really help to jog your memory in Dungeon Lords, chances are that you will forget some of the smaller rules - like moving one step towards the "nice" side of the evil-o-meter after having a dungeon tile conquered. That one, specifically, is clearly marked on the gameboard, but there are enough small rules that unless you play it on a regular basis, some will probably be missed. Overall, I give Dungeon Lords a 9.0/10. I almost slipped this score down a bit, but eventually decided not to. 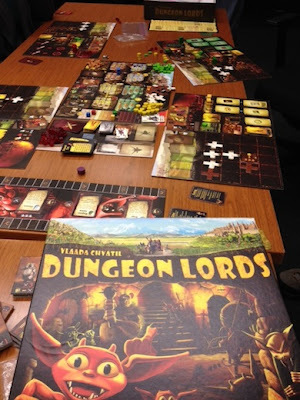 I really like Dungeon Lords - I think that it has a solid theme and mechanics that flow very well. 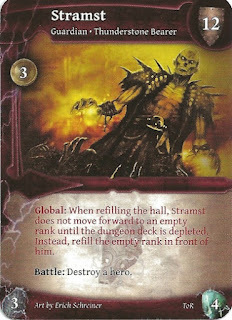 And, even as a Dark Overlord, the game doesn't have a dark or creepy feel, so it's theme is really open to everyone. If you like Dungeon Lords, you should also check out Age of Empires III, Cookie Fu (if you like quirky themes), and Through the Ages (which is by the same designer as Dungeon Lords). Going from Castle Panic to the Wizard's Tower is (in video game terms) like going from the "Normal" difficulty setting to the "So Insanely Difficult That You Won't Win Unless You Never Do Anything But Play This Game" difficulty (I think Halo had these difficulty settings - though they called the second one something else.. "Legendary" maybe?). 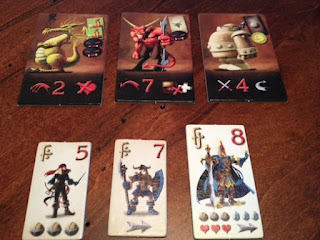 Basically, you take the basic game of Castle Panic and you add a lot of nasty monsters. 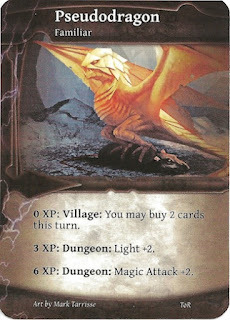 Plus, you remove some of the standard, "easier", tokens and replace them with more monsters. Oh, and on top of all of that, you have "mega" monsters (which are insane - like the Hydra that for each point of damage you deal to him causes two Imps to show up in the Forest). Fortunately, you have been smart enough to employ a wizard (do not let him die! ), and so he is helping you in your fight. Basically, the big differences to the gameplay are that 1) there are a ton of big, nasty monsters, 2) there is a wizard deck that you can draw from when performing a discard and draw action, 3) things can catch on fire. Since I've covered the first two, I'll briefly mention fire. If a monster is caught on fire, then he takes a point of damage at the end of each movement phase. If your structures catch on fire three times, they are destroyed. Also, when on fire, structures do not damage monsters that attack them - though they do catch those monsters on fire. The first new element of the Wizard's Tower are the new monsters. 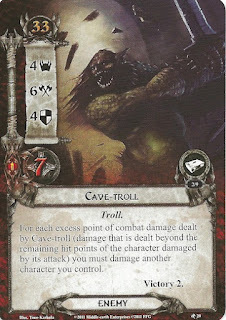 I like the new monsters - I think that they add quite a bit of variety to the game (though it can be annoying to have to look up what they do on your cheat sheet every time one comes out in your first few games). There are monsters that are immune to damage in certain rings, but can be killed by one hit in other rings. 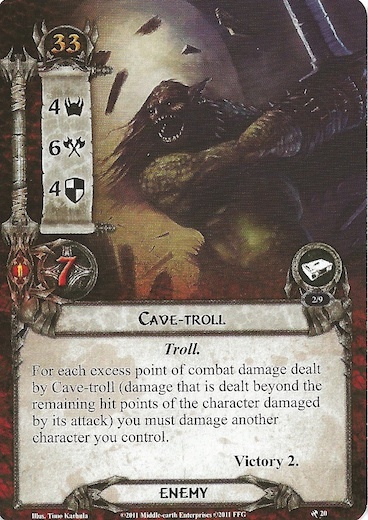 Other monsters can climb your walls, move two spaces at a time, bring out imps, have four damage, and several other things. 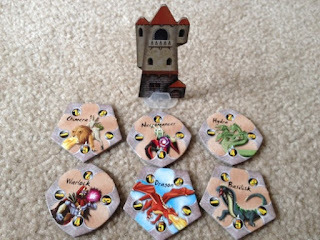 Also, the Wizard's Tower introduces the "mega" monsters. These monsters are the Superman of monsters - and the game would be harder, even if they weren't included! Each game that you play, you randomly pick 3 of the 6 mega monster tokens (using their "harbinger" tokens, which have the standard triangular shape so that you will still pull tokens randomly from the new monster bag). All of these "mega" monsters have more than three hit points, but they also have some extra abilities - some of which are especially powerful, like the Hydra (mentioned earlier) and the Basilisk, which prevents you from being able to perform the "discard and draw" phase of your turn. The second new element of the Wizard's Tower is... the wizard's tower. One of your standard towers is replaced with your fancy new wizard's tower, and as long as it is not destroyed, you can draw cards from the wizard deck when you perform the "discard and draw" action. These cards are crucial, and without them, you would have no chance in the game. These can allow you to rebuild towers, hit every monster in a single space for one damage (very useful if you just killed a Hydra and it spawned 8 Imps), prevent monsters from moving for a turn, and many other things. I think that this is a neat element, and the wizard fits thematically. However, I'm not sure if I prefer the separate deck, or if I would have preferred the new cards to simply be added to the standard castle deck. 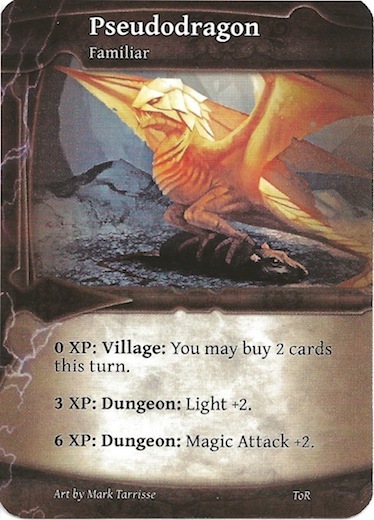 (As a note, there are also a few cards that are added to the castle deck - mine were just barely larger than the original castle cards so that they didn't shuffle especially well. This was probably my biggest complaint with the entire expansion.) Overall, I don't think that it takes anything away by having separate decks - and it forces you to protect your wizard's tower more than the other towers, so it probably is better to be a separate deck. My only victory - it was close! Finally, there is fire. I have played several games, and I have only ever seen one structure be destroyed by fire. However, I have seen several monsters be heavily damaged by it. I guess it wouldn't make much sense to have the monsters affected but not the castle itself (unless it was "poison" instead of fire). However, in my experience it feels like adding the fire to the castle seems a bit like busy work, since you probably won't lose your structures to flames. Fire is a helpful thing for slowly killing large monsters, though. Also, fire is a way of allowing the dragon to make more sense - he doesn't directly attack your castle, but he breathes fire on it. In summary, I like that you can slowly deal damage to monsters, but I think that fire is fiddly on the castle structures. Overall, I give the Wizard's Tower expansion an 8.5/10. 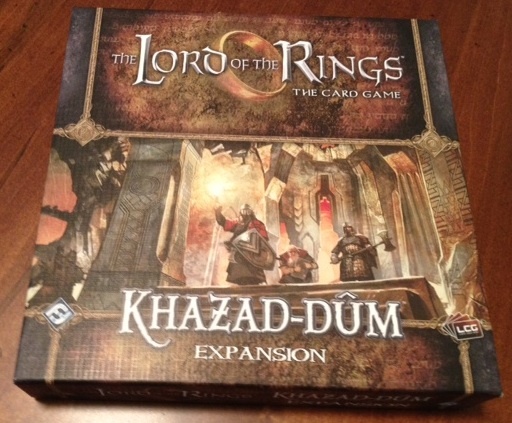 (Oh, yeah, I really have no idea how to score expansions.) I gave Castle Panic an 8.0, but now that I've played with the Wizard's Tower, I don't think that I'd ever want to go back and play the basic game without it - which I guess is really the trademark of a great expansion! 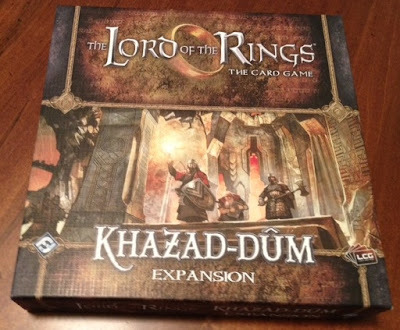 While we're talking about expansions, some other expansions that you might want to read about are Thunderstone's Wrath of the Elements Expansion, Nightfall's Martial Law Expansion, and Lord of the Rings: The Card Game's Shadows of Mirkwood Expansions. "Like Trying to See Through a Blindfold While Being in the Forehead with a Taser"
"Like Trying to Defeat Superman in an Arm Wrestling Contest while using a Prosthetic Arm"
"Like Trying to Make an NFL Team as a Freshman in High School"
"Playing Call of Duty on XBox Live"
"Beating Tiger Woods in Golf Using Nothing but a Putter"
"Hitting Off of Nolan Ryan While Standing ON Home Plate"
I would like to thank Fireside Games for providing me with a review copy of Castle Panic: The Wizard's Tower expansion.